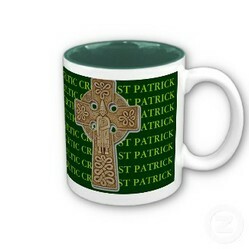 Top 'o the Morning with one of these St. Patrick's Day mugs to hold your tea or coffee. 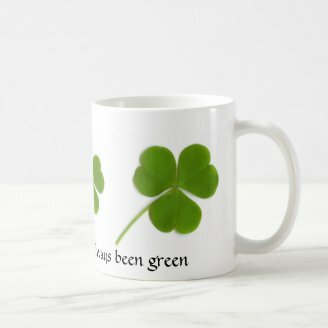 Celebrate St. Patrick's Day by putting on the green with your morning coffee or tea, and then wear your shamrocks all year long whenever you drink your mug of tea or coffee. 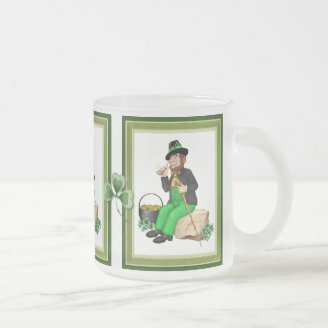 These St. Patrick's Day mugs will warm your heart and touch your funny bone. We Irish love our cups of tea. Okay, some of us like coffee, too. A few other beverages could be mentioned, and actually these mugs come in the frosted glass mug style that are reminiscent of the neighbourhood pub. St. Patrick's Day calls forth all those wonderful ancient Irish blessings and sayings. These words of wisdom are often full of wit and laughter. They also recall the Celtic connection to Creation and their love for the land. 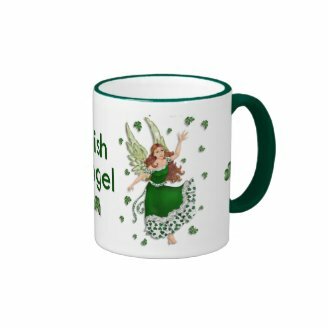 These mugs on this page include images of angels and shamrocks and leprechauns. We have Celtic crosses and even green teddy bears! I hope you find the perfect mugs for yourself and to give as gifts to your friends. It wouldn't be St. Patrick's Day without a little bit of Blarney, right? So here are some mugs that draw on the silly side of the Celtic consciousness. Some are silly and some are just cute. And then some are just plain angelic. Just like someone you know (or any of us at various times of the day). Celtic Christianity was alive with blessings. The Celts spoke of the thin place where a person could be closer to the divine. Some people have that thin place in their hearts and see the world as full of blessings. These mugs can share your sense of gratitude for all things, including the earth and the sky and the sea. 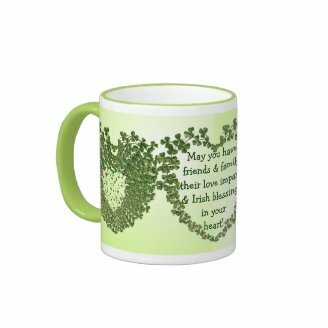 The mug directly below these words bears the Irish wedding blessing, dear words for launching a couple into their new life together. 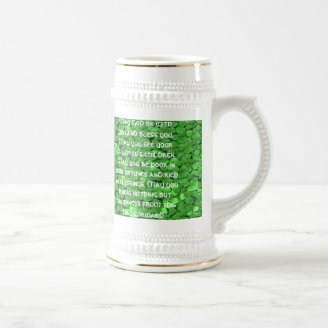 Other mugs have heartfelt words, too, and some blessings even contain a tongue in cheek blessing that you can outwit the devil. Of course, St. Patrick's famous prayer, called alternately the Breastplate, the Lorca, or the Deer's Cry, carry words of deep connection to all of Creation. These powerful words can enter deep into your heart and become your inner meditation. How Will You Celebrate St. Paddy's Day This Year? For me, St. Patrick's Day is a religious holiday. I'll get together with friends and family. It's the big parade for me! We'll eat our boiled dinner or Irish stew, with a bit of Irish soda bread. Are you kidding me? A few Guiness and I'll be a happy Irish rover. I'll be wearing a "Kiss Me, I'm Irish" pin, and get as many smooches as I can get! May You Be in Heaven . . . 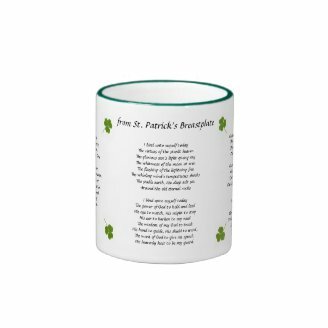 Thanks for Visiting My St. Patrick's Day Mugs Page on Wizzley! 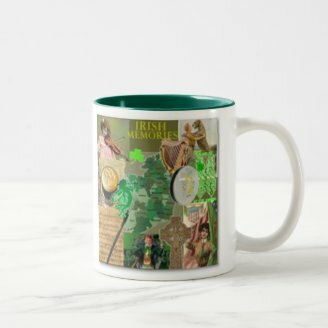 I hope you have enjoyed your perusal of mugs with Irish and St. Patrick's Day themes. 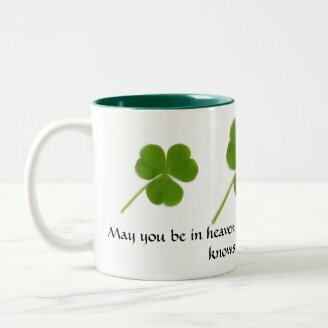 Maybe you have found a special mug to share with your favorite Irish someone. The blessing mugs are my favorites. These words stay with a person long after the tea or coffee is gone. These mugs make nice reminders of your care and loving thoughts whenever your friend or loved one rolls out of bed in the morning. You will make someone happy with a St. Patrick's Day gift. 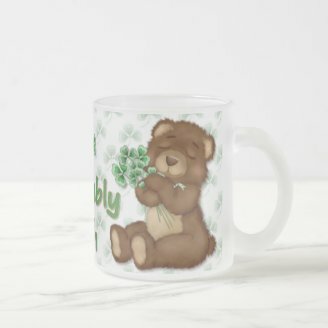 If you haven't found just what you were looking for, perhaps you could continue to search the Zazzle site where many more designs await you. Any of these pictures will bring you to the site if that's what you'd like to do. Whatever you decide to do, I wish you a blessed St. Patrick's Day! Thanks, Kinworm. I'm sending a couple of them to my family members. 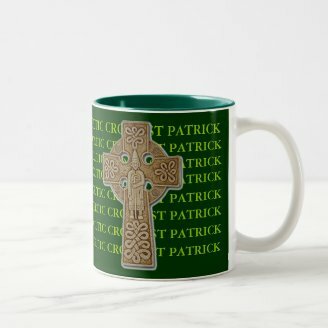 I'm sure anyone would be lucky to receive one of these pretty St. Patrick's day mugs. St. Patrick was the patron saint of Ireland. Find out more about this great man whose feast day is celebrated with green beer. Would he be blushing if he knew?